A few weeks ago, my daughter Reece, who is a lax freak, came to me begging for a new shaft because her STX Vortex broke after just months of play. A few of her friends had recently gotten eco-friendly, Bamshafts and were playing better than ever and feeling pretty awesome that they were able to green up their game. I was really excited that Reece wanted to be a art of the Bamshaft revolution and was excited to share their efforts with you too. You see when one company starts to make an effort to go green, an interesting domino effect takes place. 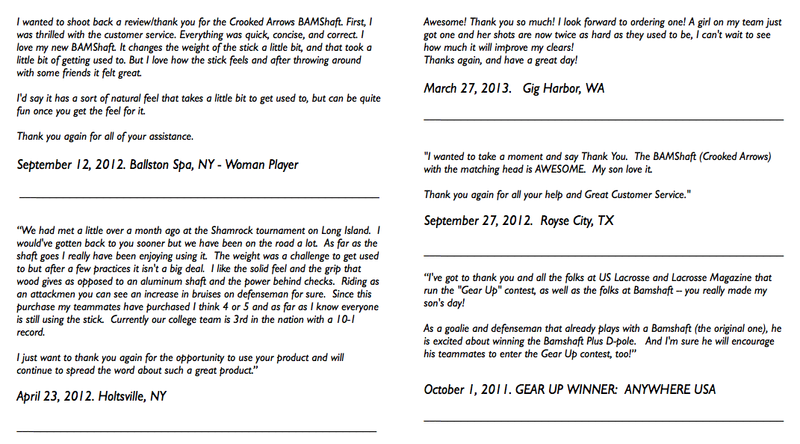 When other sporting goods manufacturers see the success Bamshaft is having, they will take notice and make their own eco-changes that will help players of other sports go green. The founder of Bamshaft, Paul, is working to turn lacrosse and in turn other sports green but not at the expense of creating a great product. Players all over the world are finding that their bamboo made Bamshafts are strong (longer lasting than traditional shafts), lightweight, offer up great accuracy, stay warm in the winter, flex, and bring you a faster shot. In fact, Bamshaft is an official sponsor of the Norwegian Men’s Lacrosse team. The Bamshaft brings you a unique feel unlike any other lacrosse shaft made all while being eco-friendly. Bamshaft utilizes eco-friendly Bamboo which grows fast and requires no pesticides. After only four years, a bamboo plant reaches maturity and Bamshaft’s are ready to be made using a patented heat treatment process. The bamboo is cut, sanded and prepared for shaping. The raw bamboo stalks are then stripped into sections and glued together. This segment is now heat treated and shaped again into round, solid bamboo shafts. From here, the Bamshaft is shaped and finished specially for you. Paul Guarantees that with any shaft you purchase, you are free to try it out, play catch and send it back if it isn’t exactly what you imagined. My bet is that you won't be sending it back. 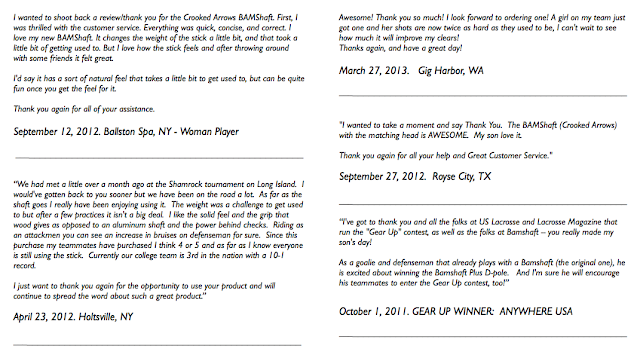 Reece is a Bamshaft fan for life and I have a feeling we will be buying another shaft soon as a back up to her current Bamshaft as well as picking up a Bamshaft 2.0 head. Keep it up Paul. You are leading the way to greener sports worldwide and we love it. Full Disclosure: In return for writing about Bamshaft, Paul the owner was kind enough to send my daughter, Reece, a shaft which she was begging me to buy for her. Thanks Paul! !